Your kids will want to wear their party hats all day long if they are as hilarious as these DIY Dory party hats from Kara’s Party Ideas. Not sure, but we think all kids will start speaking in whale as soon as they put them on their heads. 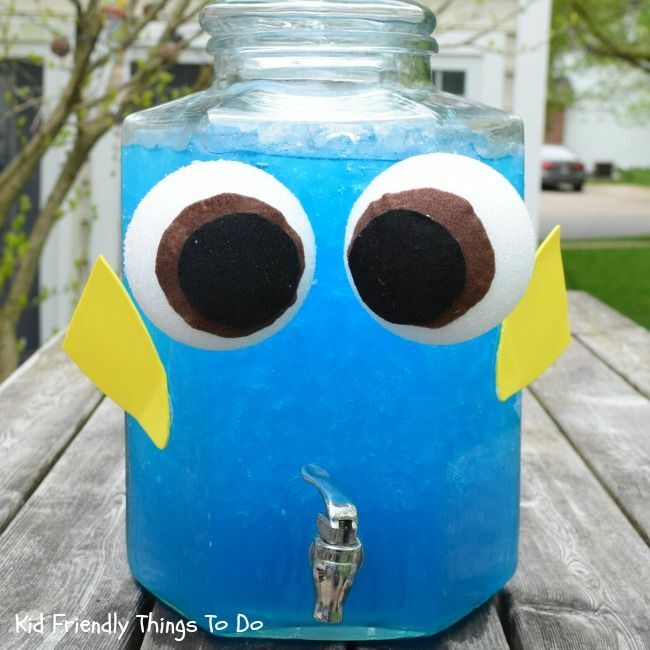 Turn a big beverage container into Dory herself with the clever DIY Finding Dory beverage dispenser idea from Kid Friendly Things To Do. Just make sure you fill it with a blue-hued drink. 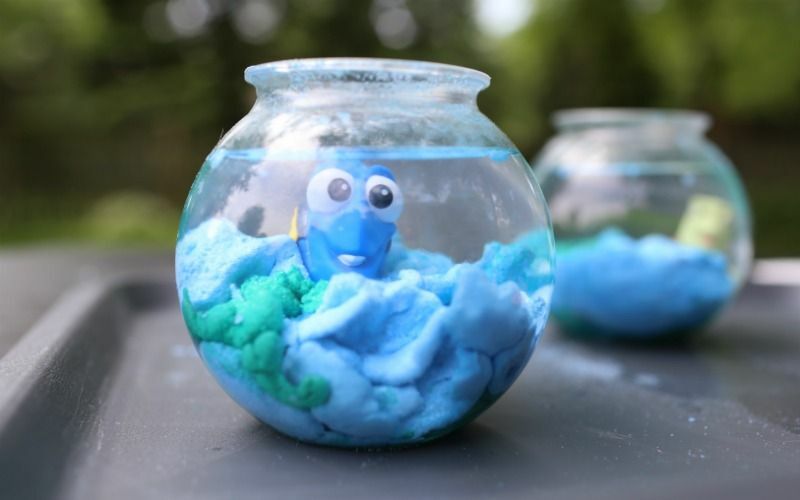 Dory won’t mind finding herself in a fishbowl when it’s part of this squishy and fun sand craft activity from Lemon Lime Adventures. These make great little favors for your guests to take home with them too. 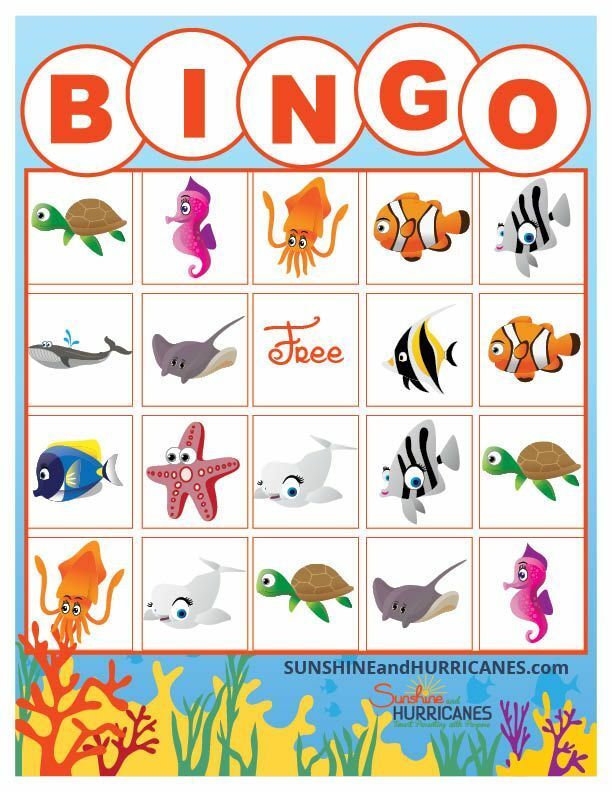 This printable Dory Bingo game from Sunshine and Hurricanes makes a fun and easy activity that all ages can play together. We love their suggestion for what to use as markers in this game, though you may want to buy some extra in case the kids are hungry. Considering Dory spends the entire movie on her own special search, a scavenger hunt for your party seems quite apt. 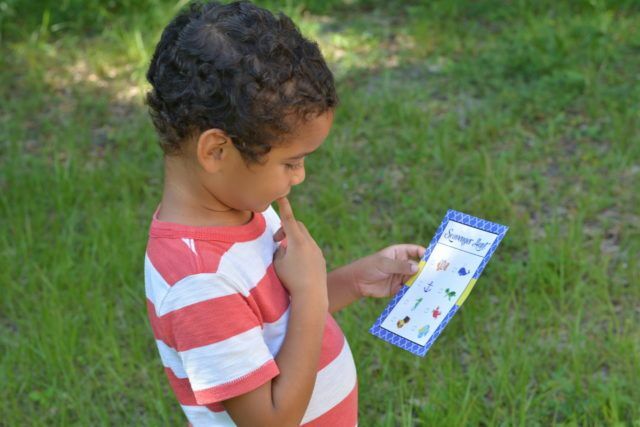 And the printable cards from Jolee Studio allow you to personalize your party’s hunt to be indoors or out and as easy or hard as you want to make it. 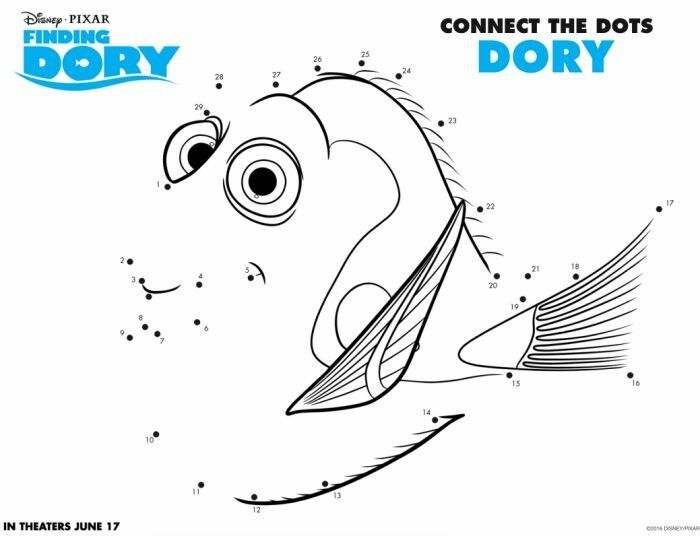 Settle the kids down before it’s cake time with the free printable Finding Dory activity sheets found at I am a Mommy Nerd. With coloring pages, dot-to-dot, and a maze, there’s enough for kids to do as many pages as they want. We’re cracking up over the funny and clever snacks served at the Finding Dory birthday party shared at Fandango. Love the silly turtle sandwiches and the wry Hank the Septopus which is really just an orange and some dried mango strips. If you’re handy with a piping bag, you can even make some cute cookie otters that your guests will gobble up. 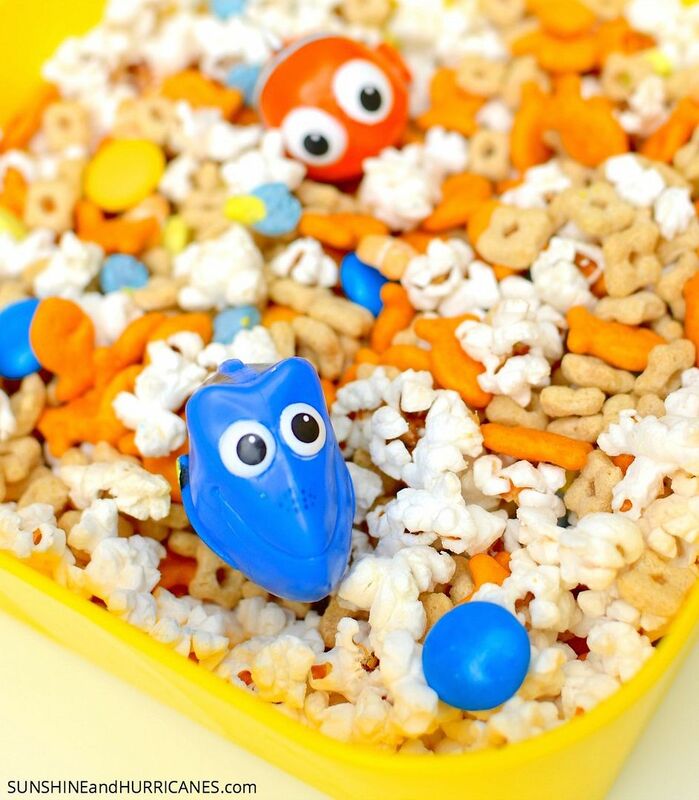 An easy-to-assemble snack mix, in Finding Dory colors of blue (for Dory) and orange (for Nemo) is such a clever way to include a “themed” snack without breaking a sweat. Sunshine and Hurricanes recipe includes sweet and salty treats mixed together in a fishbowl-sized bowl. Everyone’s favorite Septopus, Hank, shows up to the party in the yummiest possible way with this Finding Dory birthday party treat from Mrs. Kathy King. 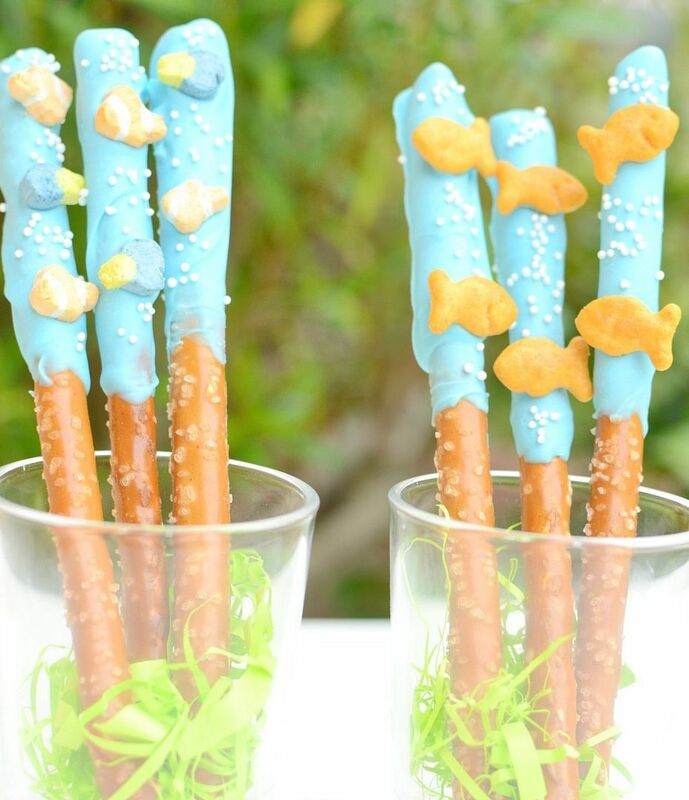 Chocolate covered pretzel rods get dressed up for the party with these Finding Dory “under the sea” pretzel treats from Sunshine and Hurricanes. 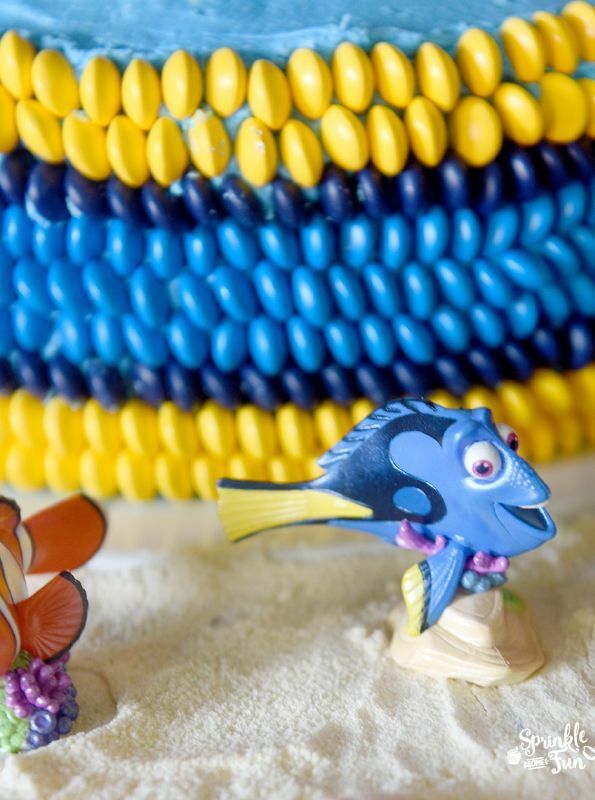 Not all of us can sculpt a Dory out of fondant, so we love this Finding Dory cake that mixes some store-bought toys with an M&M bordered-cake that isn’t too hard to replicate. You’ll have to check out the incredible, but still doable, display on top, though we’d probably just stick a few toys on top and call it a (birth)day. 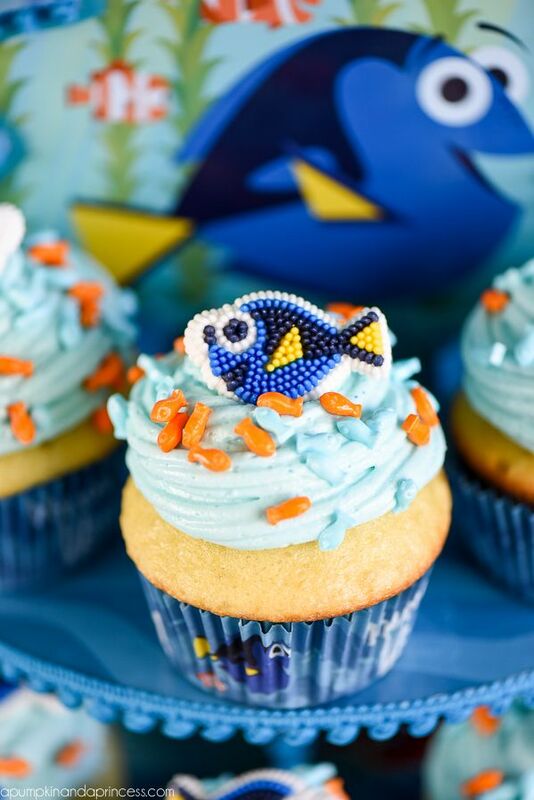 With some adorable Dory edible decorations and A Pumpkin and a Princess’ suggestions, it’s not difficult to make your own Finding Dory birthday cupcakes. Just keep swimming one of those beauties into our mouth okay? 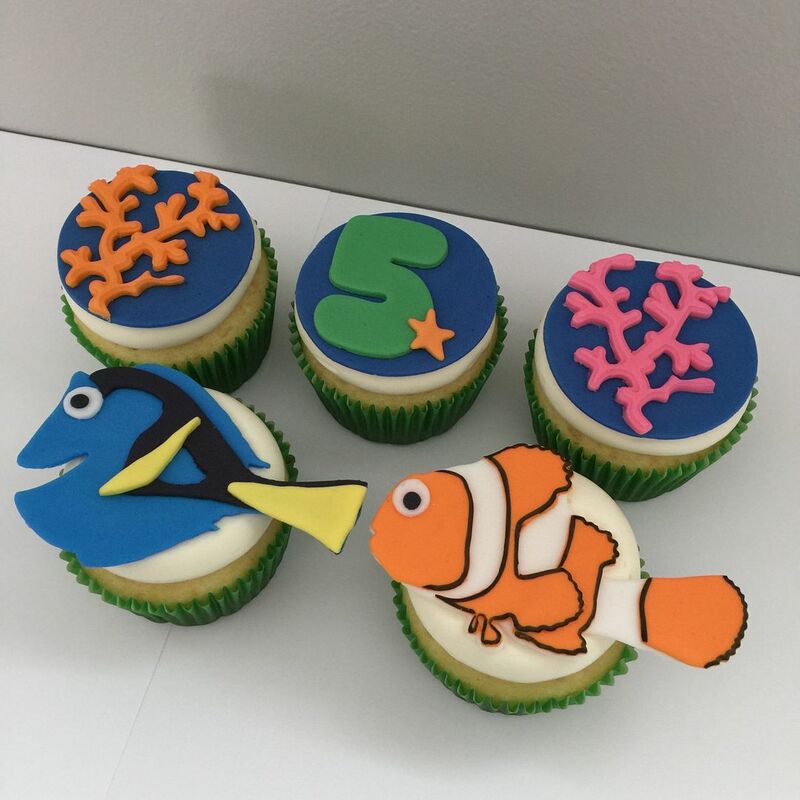 The dozen Finding Dory fondant cupcake toppers from Bakers Love Bakery will turn plain homemade or store bought cupcakes into mini works of art. 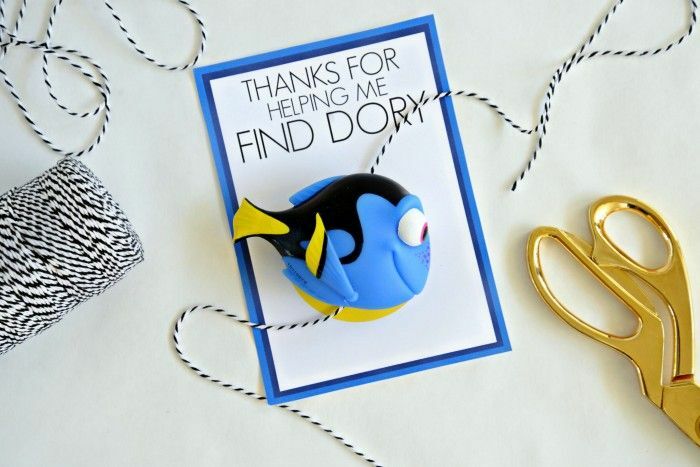 A little Dory toy becomes a thoughtful party favor when attached to this free printable Dory card from Hello Splendid. 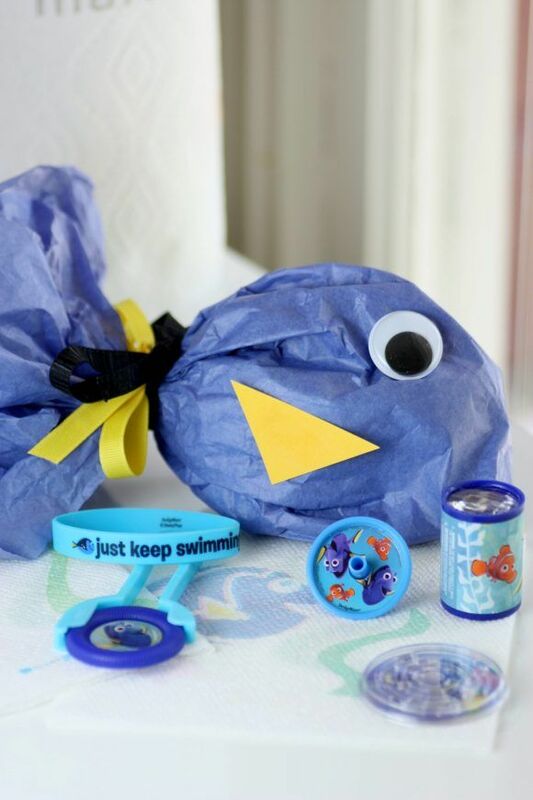 We think our kids’ friends will be thrilled to swim off with one of these, don’t you? If you want to wrap up your favors, check out this smart Finding Dory DIY favor bag from Catch My Party. Not too difficult, yet the finished product is so great, it’s the kind of craft project we really love. 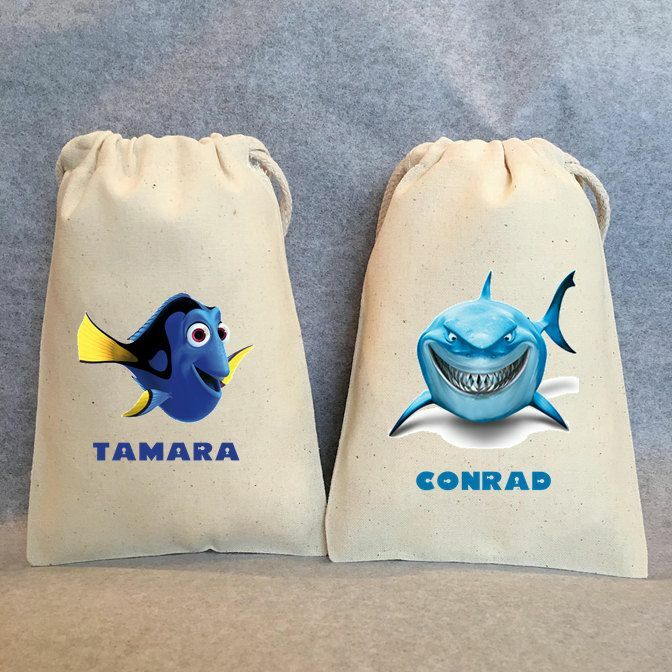 Or send your party guests off with a few treats tucked into one of the personalized and reusable Finding Dory favor bags from Owlways Remember on Etsy. The bags themselves make such a nice momento, they may hang around longer than the treats inside. 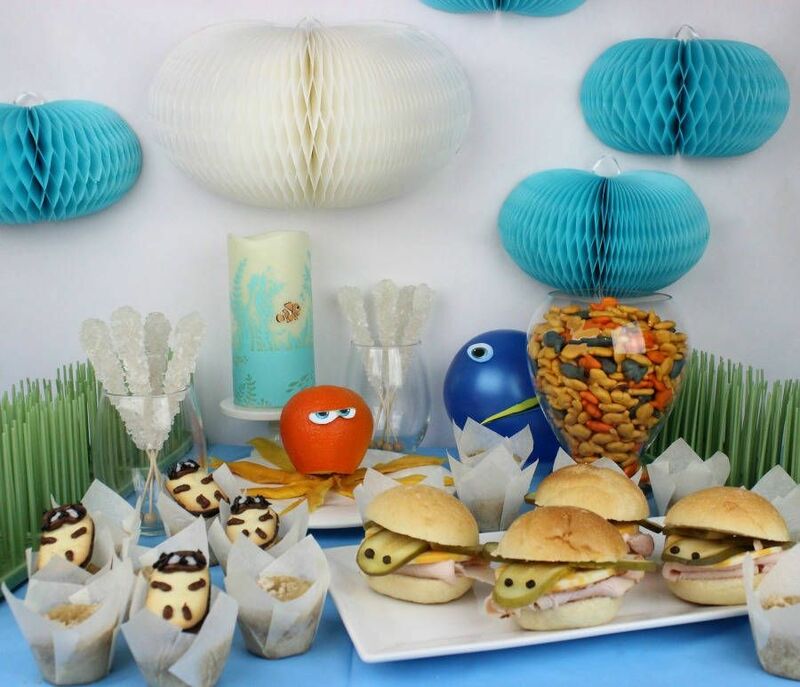 Thank you for sharing our Finding Dory party by Laura’s Little Party! 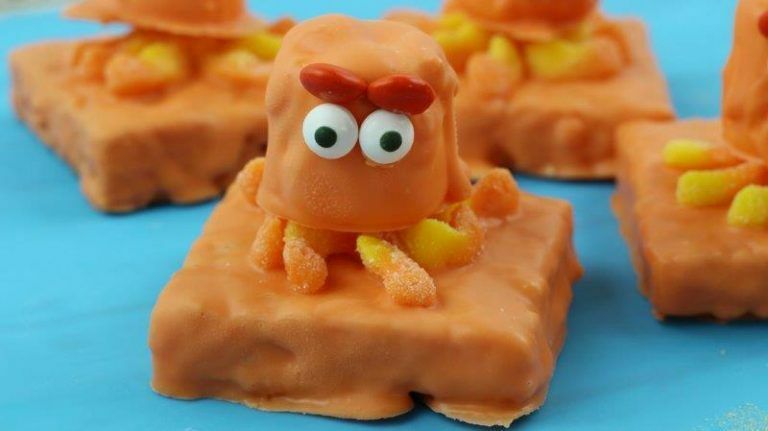 Thank you for sharing our Hank Septopus treat.